We have heard for as long as anyone can remember how important it is to exercise and all the benefits that comes from it. Better heart, better lung, reduced disease risk, strong muscles and the list goes on and on. Science is doing everything it can to tell you why it is important and there has been another step taken with some of the latest research on how working muscle has a direct effect on your bones. It has long been somewhat of a puzzle how these two tissues communicate and interact but this study takes a step to explain it. Using young male mice because researchers could see bone accrual at this age, they injected them with irisin. Irisin is a myokine that is derived from skeletal muscle and can also play a role in the regulation of body fat. Researchers found that in the injected mice there were significant increases in bone mass and strength. This was seen particularly in cortical bone (the outer shell and most dense). This type of bone is the outer structure of your skeleton and makes up 80% of your skeletal weight. Researchers did not find an effect on trabecular, or spongy bone, in this study. As we mentioned above we all have been told the importance of exercise for many reasons but now there has been a direct link established that tells us exactly why it is so important, especially for bone growth. The results of this study are far reaching in that new therapies and treatments can be created to prevent not only bone loss but as sarcopenia (muscle wasting). This is huge for not only athletic type injuries involving the bones but also for everyone aging and losing bone and muscle mass. 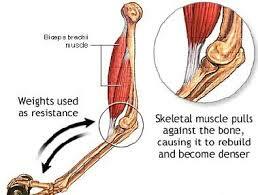 Keep exercising and stressing your body and bones (within reason) to keep stimulating change within the bone and strengthening everything.